A collaboration between Spanish research institutes—led by the nanoGUNE Cooperative Research Center (CIC)—has achieved a breakthrough in so-called molecular electronics by devising a way to connect magnetic porphyrin molecules to graphene nanoribbons. These connections may be an example of how graphene could enable the potential of molecular electronics. Porphyrin is an important molecule that is responsible for making photosynthesis possible in plants and transporting oxygen in the blood. Recently, researchers have been experimenting with "magnetic porphyrins" and discovered that they can form the basis of spintronic devices. Spintronics involves manipulating the spin of electrons and it is this spin that is responsible for magnetism: When a majority of electrons in a material have their spins pointing in the same direction, the material is magnetized. If you can move all the spins up or down and can read that direction, you can create the foundation of the “0” and “1” of digital logic. Spintronic devices based on the porphyrin molecule exploit the magnetic atom—usually iron, which has spin-polarized states—that is in the middle of each molecule. There are a number of ways of exploiting the spin of these magnetic atoms to polarize the transported current. 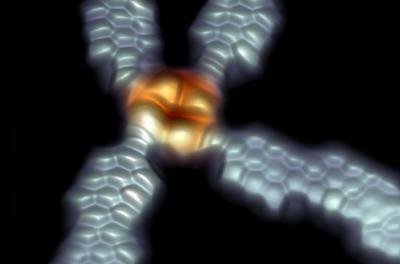 If magnetic molecules with a larger spin are used—the so-called a single-molecule magnet—a “1” or “0” state could be stabilized by a magnetic field and read by currents. In future research, the researchers will aim to use single-molecule magnets, and improve the magnetic function in transport experiments by injecting current though the ribbons. “This will be closer to the real usage of these devices”. This work was conducted by teams at CIC nanoGUNE, Donostia International Physics Center (DIPC) and Materials Physics Center (CFM, CSIC-UPV/EHU) and synthetic chemists from CiQUS (Center for Research on Biological Chemistry and Molecular Materials at the University of Santiago de Compostela).